Whirlpool Jenn-Air Range Cooktop Stove 8 Heavy Duty Surface Burner Y04100166. This heavy duty 8 burner element has 5 turns/rings and has a heavy duty D-Frame structure to support the element. This burner element is rated at 2100 watts. The wire looped terminals have been replaced with these solid terminals. This element also replaces some flat style terminal elements. Whirlpool Estate KitchenAid Roper Maytag Admiral Amana Speed Queen Jenn-Air Magic Chef Crosley Caloric Glenwood Hardwick Menumaster Modern Maid Montgomery Wards Norge JC Penney Wards Sears Kenmore. The surface burner elements, those metal components that get red-hot and generate heat, are the most important parts of any range. When the elements fail to heat properly, it's time to replace them. It's a simple procedure any electric stove owner can easily accomplish in a few minutes' time. You can usually identify a burnt-out element by blistering or small holes on the element's coils. A burner that plugs into a receptacle is easy to test, just unplug the non-heating burner, plug it into another working receptacle, restore the power to the range, and test it. If the burner works, you know its original receptacle is probably faulty. If it doesn't work in the good receptacle, the burner is bad and must be replaced. Do not be alarmed if a new element smokes a little when you first use it. Y04100166 04100166 4381750 Y0E00801799 400178 19950009 15928 1938-344 1938-249 0E00801799 7406P050-60 74005447 715928 707457 7-7457 7-15928 550072 5-50072. 2300 2300ERS 2380EGS 2480 2513 2514 2514A 2514B 2515 62942015 62942865 62942869 88890 89890 A100 A100-C A100B A100B-C A100L A100L-C A100W A100W-C AC110B C200 C201 C201-C C202 CAE1000ACB CAE1000ACE CCE1400B CCE1400B-C CCE1400W CCE1400W-C CCE407B CCE407B-C CCE407W CCE407W-C CDE820 CDE850 CDE851 CDE852 CLE700 CNE200 CRE200 CRE200B CRE300 CRE300B CRE350 CRE350B CRE400 CRE400B CRE500 CRE500B CRE600 CRE600B CRE650 CRE682 CRE682B CRE700 CRE750 CRE750B CSE600 CSE601 CSE7000ADE CUE840 CVE1400B CVE1400B-C CVE1400W CVE1400W-C CVE407B CVE407B-C CVE407W CVE407W-C CVE4180B CVE4180B-C CVE4180S CVE4180S-C CVE4180W CVE4180W-C D-170 D-445 D-456 DCSE600 DCSE601 ED1-76W19 ED9-71A539R ED9-71W539R EPD8-69KY919A EPD8-69KY919W EPD9-79KA659A EPD9-79KW659A GCLE700 GCNE200 GCRE200 GCRE300 GCRE350 GCRE400 GCRE600 GCRE650 GCRE682 GCRE700 GCRE750 GCSE600 H-445 JEA7000ADB JEA7000ADS JEA7000ADW JED8130ADB JED8130ADW LCLE700 LCNE200 LCRE200 LCRE300 LCRE350 LCRE400 LCRE600 LCRE650 LCRE682 LCRE700 LCRE750 LCSE600 LCSE601 NER1360AGH R200 R201 R201-C RC8700EDB0 RC8700EDW0 RC8720EDB0 RC8720EDW0. Our mission is to become the #1 source for all your appliance part needs. We will attempt to process your address change, cancellation and order change as quickly as possible. However, we cannot guarantee that we will be able to provide this service. Please review your order for accuracy before submitting it. The time frame depends on your location and is determined by the Post Office. You may go to their website and click "Calculate a Price" to determine if your package will take one or two days to deliver. Tracking information is accessible once the item is delivered to the post office or picked up by UPS. These charges are not refundable for all correctly filled orders. Please review the entire listing carefully and make certain you are ordering the part you need. Please note that appliance manufacturers frequently update their parts without warning. While we strive to update our listing pictures as quickly as possible, an outdated picture is not grounds for return. You must obtain a return authorization to return the part within this time frame. Parts are not eligible for return for any reason if we are not notified within the 14 day time frame. This is to insure that we can file a claim with the carrier when applicable. All items must be in a brand new (without signs of installation) and resaleable condition. All parts are inspected for signs of installation upon our receipt of them. In no way shall General Appliance Parts be liable for any loss, damage, fire, explosion, injury, including any incidental or consequential damages, or death as a result of ordering and/or installing any parts from our website or from the results of any action taken due to reading information found on our website. The information is provided as a courtesy to our customers to enhance their understanding of their appliances, it is not to be taken for instructional purposes on how to repair their system. General Appliance Parts suggests having all parts, accessories and equipment installed by a qualified heating and air conditioning technician. If a customer attempts to install a part, accessory or equipment, he or she should have a thorough understanding of electricity, reading wiring diagrams and the work to be performed. In no way shall General Appliance Parts be liable for any loss, damage, injury, including any incidental or consequential damages, or death as a result of ordering and/or installing any parts from our website or from the results of any action due to reading information found on our website. 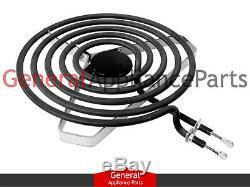 The item "Whirlpool Jenn-Air Range Cooktop Stove 8 Heavy Duty Surface Burner Y04100166" is in sale since Friday, May 23, 2014. This item is in the category "Home & Garden\Major Appliances\Ranges & Cooking Appliances\Parts & Accessories". The seller is "generalapplianceparts" and is located in Louisville, Kentucky. This item can be shipped worldwide.